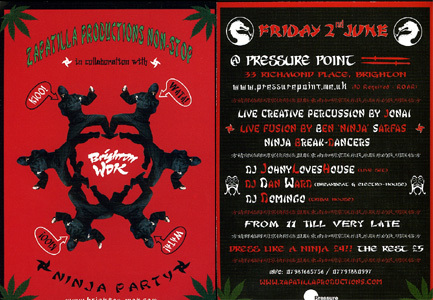 Latest party of Zapatilla Productions in Pressure Point, this time promoting the movie filmed in Brighton Brighton Wok. Zapatilla Productions put on a great show, with live music by Ben Sarfas on sax and Jonai in percussion. There were Ninja breakdancers and various DJs.